Both the recipe for Angelled Deviled Eggs and the list of holidays for the month of May are further down this post. Please scroll down to go directly to either. Despite what your doctor would frighten you into believing about animal fat and cholesterol, you can, perhaps even should, eat eggs every day during the month of May to celebrate National Egg Month. Or maybe your cardiologist would prefer that you do eat eggs, particularly in the form of creamy dreamy deviled eggs to coat the insides of your arteries with full fat fatty fatso mayonnaise so he will have enough business to fund his cutback to 9-holes for the duration of this recession. 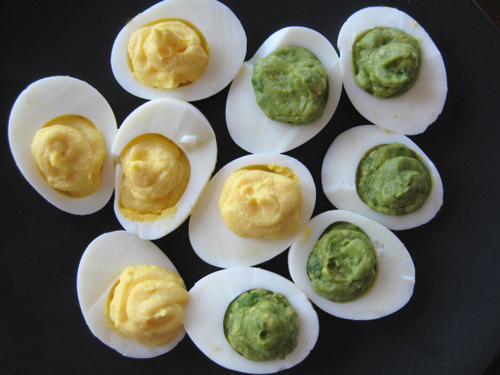 Unluckily for him, I make a not-so-naughty version of deviled eggs made with fat-free plain yogurt instead of mayonnaise in half of the hard boiled egg halves and guacamole “lite” in the other half. If I could, I would eat these “Angelled” Eggs every day, but I’m punishing myself with deprivation for coming up with such a cutesy E-V-yumm-O-oh no you di-int name like “angelled.” I know, it makes me want to *gag*, too. The recipe for “Angelled” eggs is very loosely based on the recipe in my ATF cookbook, The Joy of Cooking. Joy of Cooking also adds a few teaspoons of each of minced fresh herbs, shallots, and Worcestershire sauce. I don’t. Peel hard boiled eggs and slice in half length-wise. Scoop out hard boiled egg yolks, and only use half of them. What you do with the other half is up to you, but if you eat them, you’re missing the point. 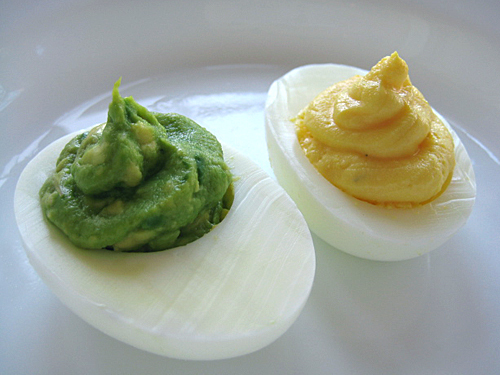 Mash the hard boiled egg yolks with a fork, then mix with all the other ingredients until as smooth as possible. Spoon into hollows of 6 egg white halves, or you can be FANCY and pipe them into swirls. Mash the ripe avocado until smooth and add 1-2 tsp yogurt, 1 super finely minced garlic clove, finely chopped half a small onion, salt/pepper to taste, and if you can handle it, either hot sauce or finely chopped fresh jalapeno. Spoon or pipe into the other 6 egg white halves. As for all the other National [blank] Month, Weeks, and Days, I can’t keep up. I mean, really? Tear open up a can of Del Monte Fruit Cocktail on May 13?